IBM Patients, mark your calendar and join us for this free non-medical, patient-led, open discussion video support session with Mary Jane. Join to share experiences, ask questions, compare notes, and make new friends. See details below on how to join by video. Where: Online – Join us from wherever you are at the time. No need to dress to impress. Join in your pajamas if you want. You do NOT have to register. 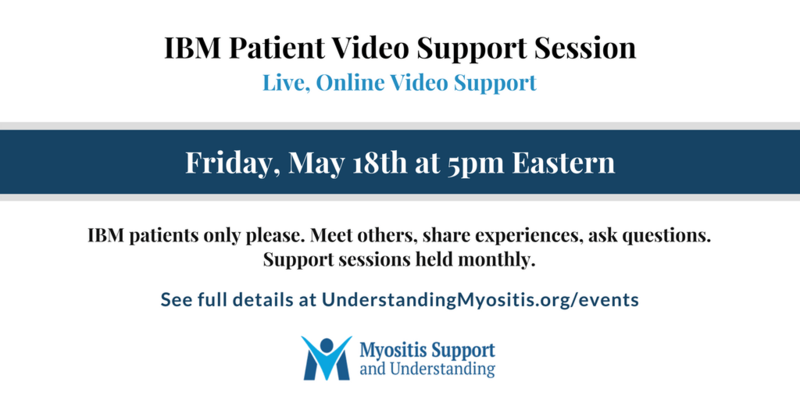 Simply click the button above on Friday, May 18th a little before the start time of 5PM Eastern (4PM Central, 3PM Mountain, 2PM Pacific) to join the IBM Patient Video Support Session. If this is your first video chat session, please login at least 20 minutes prior to ensure all works well for you and any downloads and installations you may require are completed by the time the session starts. Please add info@understandingmyositis.org to your contacts and, once logged into Zoom, as a contact there for future meeting notifications. This session is tailored to those diagnosed with, or suspected of having, Inclusion Body Myositis (IBM) also known as sporadic Inclusion Body Myositis (sIBM). In addition, we have a separate dedicated video support session for those with Polymyositis, Dermatomyositis, Necrotizing Autoimmune Myopathy, Juvenile Myositis, and other unspecified or nonspecific idiopathic inflammatory myopathies (myositis).